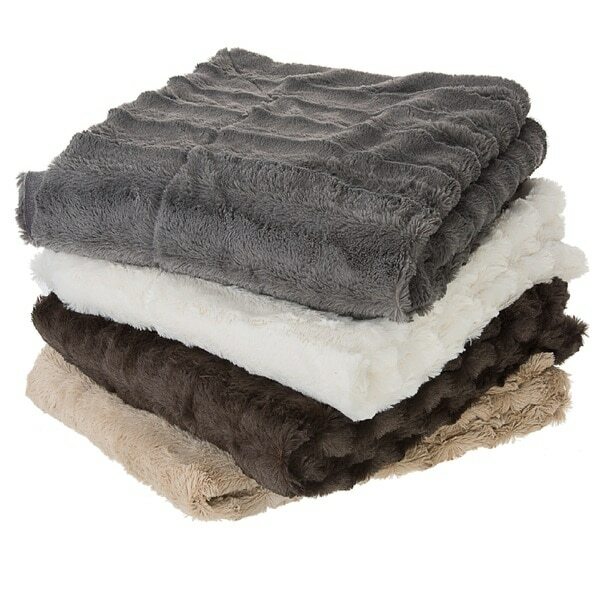 Cozy up on your couch with this versatile faux-fur throw blanket from Cheer Collection. The plush polyester blanket reverses to microplush and is machine washable for easy upkeep. Choose from nine colors and three sizes to perfectly accent your sofa or bed. I ordered the slightly off white throw from the Cheer collection. It is luxurious, beautiful and soft. You wouldn't know the fur on the blanket if faux fur. The lining is made of polyester microfiber and is as plush as the fur. The cleaning instructions are a breeze. Delicate machine wash and dry. I'm so glad I purchased this throw. It's the perfect addition to my living room. The dark brown looks very luxe and plush and feels super-soft. It's a nice big size too. I purchased the chocolate brown faux fur microplush throw. I really love that it was larger than most; i purchased the 86x86. The faux fur is very soft and has a luxurious feel which is what i was looking for. It is a bit thin tho; thicker than most but for the price i expected more substance. The reverse side of it is a thin soft microplush fabric. This throw would be even better if the two sides were stitched together throughout the middle. I find the two sides get twisted and out of alignment very easily making it sometimes difficult to unwrap yourself from it. It has held up great after 2 washings. It remains soft and comfortable. I would have given it 4 stars if the two sides were stitched together better. Option: Chocolate - 50"x60" | Sand - 50"x60"
I wanted a throw that I could put over one of my recliners. I am 5'6" tall and the throw is plenty long to cover my feet with the recliner up and plenty of the throw on either side of the wide recliner when I am sitting in it. Just the right size. I chose brown and it is a very rich dark chocolate brown-it has slight "ripples" on the outside which are attractive and the inside feels kind of like a soft satin. It is about 1/2" + thick, just the right thickness for fall, winter and early spring. I am the proud parent of a 3 year old rescue kitty who is a serious lap cat and she just loves it so we are both happy, plus the dark color won't show spots as easily as a lighter color. Couldn't be more pleased and would definitely buy again, it is well worth the money. Option: White - 50"x60" | White - 86"x86"
I ordered the white faux fur throw blanket and it’s more off-white/cream than white. The blanket in general had a cheap look to it-I would definitely not recommend to a friend. I purchased three of them, two to put on the ends of twins size beds in the 50x60 and I ordered another one in 86x86 to put on the end of a king size bed and it was too short to hang off the bed properly, it hangs slightly off the edge of the bed, but the length was too awkward. And the same thing with the blankets on the edge of a twin bed. I will be returning all three. Overstock’s customer service representative was nice, understanding, and accommodating. 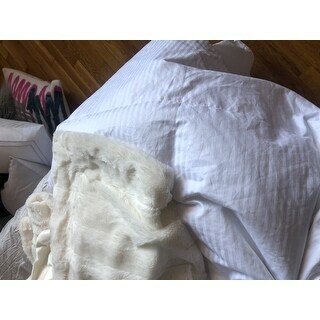 I attached a picture to show the color difference of the fur throw blanket against a white comforter. Option: Chocolate - 50"x60" | Chocolate - 86"x86"
purchased as my Mom was having to be relocated to an assisted living facility. We got both the large blanket as well as the smaller throw. My Mom still has a dark mink coat that she could not take with her, but these two faux fur blankets make her feel as if she is still wrapped in her most favorite coat. She is covered in her throw as she watches tv and she is covered in her blanket when she sleeps. These do so much to calm her down. We have had no maintenance issues or anything other than complete satisfactions with our presents to our Mom. Option: Grey - 50"x60" | Sand - 60"x70" | White - 50"x60"
Ordered the gray and the white. The white is more a slightly creamy white but they both were exactly what I was looking for. Super silky soft and machine washable! Very pleased w/ this purchase. Highly recommend! Loved them so much I ordered a 60" x 70" throw in the sand color for my son. He lives up north and these throws are perfect for keeping warm during the chilly weather! Like the larger size and the color is as pictured. Highly recommend. I bought two colors, grey and cream. Very comfy and beautiful. poor quality. you have to pay *** return it, too. incredibly disappointed in overstock for required fee to return unlike amazon. will stick to *** from now on. LOVE, LOVE , LOVE MY NEW COMFT BLANKET!!!!!! Option: Chocolate - 50"x60" | White - 50"x60" | White - 86"x86"
Before I purchased I read several reviews. Each review was outstanding.The blankets came yesterday(I ordered two). I am not disappointed that's for sure. they are so soft , nice light weight. I am ordering quite a few for Christmas gifts. This is the best blanket for hanging on the couch watching TV. FIVE STAR FOR SURE!!!!! I loved this blanket when it arrived. But within a short time, my couch--as well as the front & back of my jeans--were COVERED in tiny white fibers. I washed this blanket repeatedly (more than 10 times through both the washer & dryer) and the darned thing STILL leaves fibers all over my pillow cases, comforter, & anything that comes in contact with it. I am over it! It's going in the trash this afternoon. This blanket was exact color and texture as shown. But, this is strictly a summer or fall blanket as it is very thin. If you are someone that is frequently chilly in your house during cold weather season and want something too really warm you up, this is not the blanket for you. This throw is very soft and the color is wonderful. Also, it washes beautifully, coming out of the dryer just like new. It's a nice blanket. I thought it'd be a little thicker, but....I still like it very much. These are such a nice weight throw. My grandkids love mine, so I got them all there own to take home. Option: Sand - 86"x86" | White - 86"x86"
I ordered the large size. Nice and heavy, very soft. Ordering another now. Purchased for gifts, both receiver loved. Soft underside, suedelike, real looking fur. No shedding. Great purchase! This throw is not only a soft velvety regal purple it’s warm and cozy too. Great price and great quality. One (bad) word - SHEDS! I gave them away. Nice Chacolate color, super soft and classy! "how many come in a pk"
"Is there a size to mattress chart available? Which size should be ordered for a queen sized mattress?" There is no size chart. I would suggest you purchasing the largest size, 86x86 however, I do not know if that will cover the entire queen size mattress. I got the smallest size for a full. It's fine to cover up for one person if you take a nap and don't want to unmake your bed. I wish I would have bought the medium size. That being said, I would definitely order the largest size for a queen. I bought the 86x86 and it hangs over a few inches on my queen bed. "Is the fabric flame resistant?" I'm sorry, I don't know if the blanket is flame resistant. My guess is "no." It doesn't specifically say it's flame resistant but it's made of polyester which is synthetic so it's going to melt rather than flame. Haven't had the misfortune of actually testing it though however I work with fabric daily. Hope this helps. "How THICK is the plush throw? Thank you." It’s about a half inch to an inch thick. It is certainly a comfortable weight and too thick! However, it is not thin at all either. Hope this helps! These are made of 180 GSM cotton velvet. They are medium thickness. "How do i know which blanket i am choosing? The cubed or lined throw,how do i know which pne i otdered?" Mine is lined. I really like the blanket. "A previous question asked if the white was a true white, and the answer was yes. However, in various comments, the white is referred to as ivory or cream, and it says it's exactly as pictured, which isn't quite a true white. Can you answer whether it is white or another shade? Thank you!" The blanket I ordered and received for my mother was lovely but it was definitely more of an ivory, soft white. Wouldn't call it pure white. "How much does it weigh. The 50 x 60" one? How thick is it?" It is lightweight but very luxurious. I've washed it 3 times now and it comes out beautifully. like the day I received it. I wouldn't hesitate to purchase this blanket/throw. 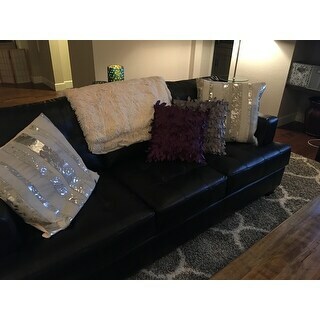 I have the white one (50x60) and it is very light...very soft and perfect for using as a throw while sitting, watching TV. It's not the kind of blanket you would use for bedding, just feels like rabbit fur and is light as can be. It is also very thin, almost silky feeling as you pick it up, it's so light. I love it. bought one for 96 yr. old mom and she adores it. It's just the right weight, not to heavy or too light. Same with the thickness!